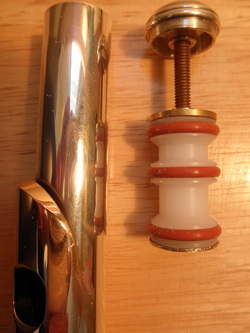 Seidman Flute Stopper Plug replaces the cork in your existing cork mounting hardware, as shown to the left. Most things in life that appear "too good to be true" are a disappointment. This is FOR REAL and is 100% satisfaction guaranteed. NO OTHER STOPPER PLUG IN THE WORLD CREATES THIS SHAPE SPACE AROUND THE TUBING FOR MAXIMUM RESONANCE!!! NO OTHER STOPPER PLUG IN THE WORLD HAS 3 "O" RINGS FOR JUST THE RIGHT BALANCE OF DAMPENING AND TONE CONTROL !!! This is truly the future of head joint technology, selling world wide since 2009. Fits all known brands of Boehm system flutes, wood and metal, vintage and new. Before you buy an expensive upgrade, try this flute stopper plug. If you already bought an upgrade, you can improve the sound even more with my stopper plug.